However, the scales required are difficult to reach within the near future. Many more pilot sites simulating large-scale cultivation conditions are needed to provide a foundation for technical and biological innovations as well as opportunities to generate data for techno-economical modelling. Whether results will subsequently meet expectations will depend on several factors, including breakthroughs in other energy sectors and the development of the whole production chain. The opportunities in large-scale microalgae cultivation are global and the Baltic Sea Region is not likely to be the first place where it will take place as year round cultivation is not possible due to seasonal fluctuations of light availability and temperature. However, the region has a lot to offer for applied microalgae research based on its long tradition and high quality in aquatic sciences and energy technology developments. So far activities are still somewhat scattered and unfocused. In order to increase efficiency and thus speed up advances in this sector, coordinated action is necessary across the whole region which provides incentives for all key players – not only from research institutes but also private companies from the energy sector as well as water treatment or microalgae cultivation technology – to generate nodes of excellence and alliances in microalgae biofuel research. 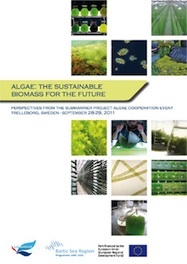 Read our Algae magazine presenting the perspectives from the SUBMARINER Algae Cooperation Event held in Trelleborg, Sweden in September 2011.